To install, place a bar through the eyebolt and screw clockwise until the gripper teeth engage the inside of the pipe. To remove from the pipe, screw the eyebolt counter-clockwise. A tap on the end of the eyebolt with a hammer will push the cones back and release the gripper teeth. 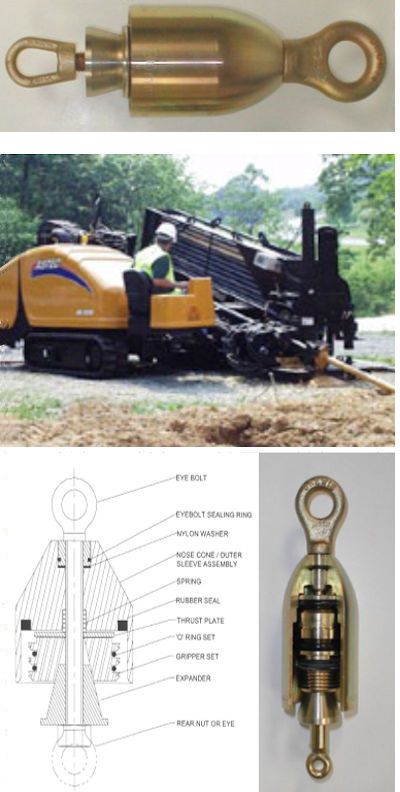 A must have for Horizontal Directional Drilling (HDD). Stops the ingress of mud and drilling fluids into the pipe. Proven reliability, tough design exceeds yield strength of pipe. No need to use duct tape or foam pig. 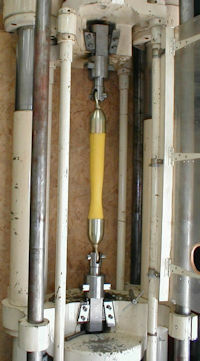 Based on the proven Standard Pipe Puller design, the inside of the pipe is sealed against liquids and mud by a rubber seal housed in the nose cone/outer sleeve assembly. This bears against the end of the pipe aided by a thrust plate and a strong spring. An o-ring seal at the rear of High Tensile Eyebolt prevents fluid ingress at this point. The outer sleeve protects the leading end of the pipe from damage as it is being pulled through the earth. The eyebolt is fitted with a rear nut or eye to prevent the Pipe Puller form coming apart during installation or removal. The more you pull on the eyebolt, the more the teeth grip the pipe. They will never let go during pullback.